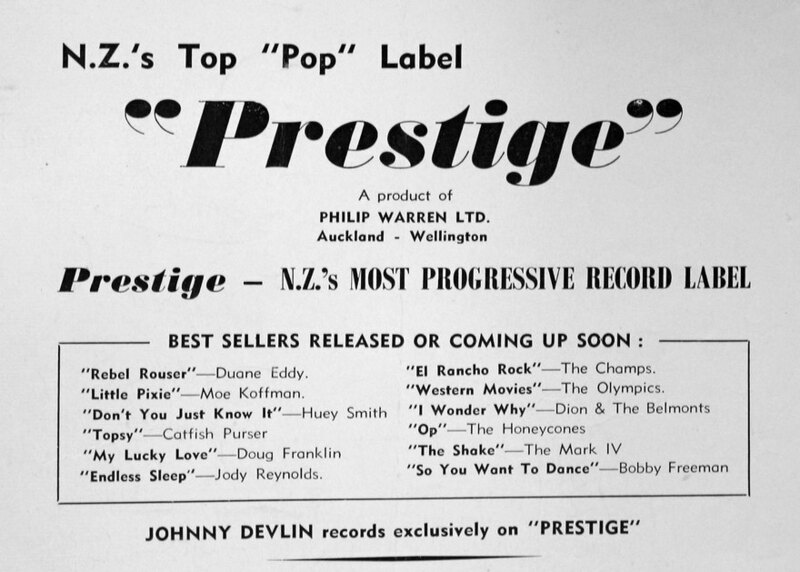 A pioneering record company which was responsible for much of the jazz released in New Zealand in the 1950s, Prestige was also the label that gave us New Zealand’s biggest rock and roll phenomenon, Johnny Devlin. 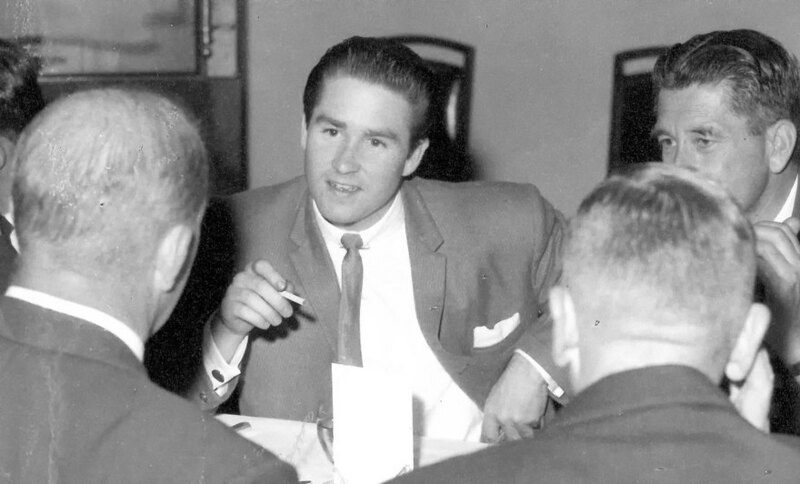 Phil Warren, a drummer and aspiring promoter, was 17 when he formed Prestige Records in 1957, in partnership with Bruce Henderson, an Auckland electrical wholesaler. Warren’s initial aim was to secure the rights to a large number of international labels that were unrepresented in New Zealand and this he did with a combination of swift talking and chutzpah, often overstating his role in the New Zealand record industry. It was a ballsy and confident pitch that paid dividends and began the career of one of New Zealand's greatest showmen and promoters. 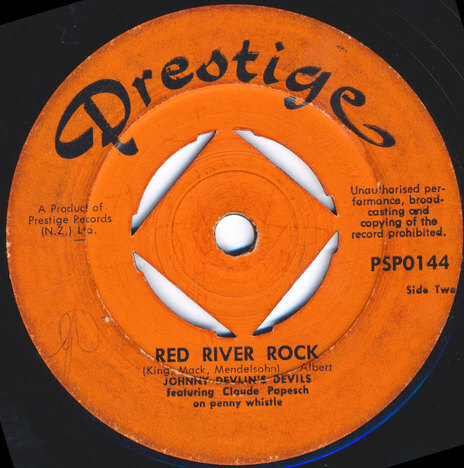 By late 1957 Prestige held NZ rights to over a dozen US and Australian labels (including the similarly named Sydney based Prestige, which confusingly had an almost identical logo), some quite substantial, and had several big hits under its belt from labels like Oriole and Roulette, putting the label on a firm financial footing. Prestige also held local licenses for Verve, Clef, Blue Note, and, later, Warner Bros. However the label with always be remembered primarily for one act. Whanganui-raised Johnny Devlin was already a live sensation in Auckland in 1958 when promoter Dave Dunningham insisted that Warren see Devlin play live at the Jive Centre (in Hobson Street – the building is still there, No.157). Warren promptly signed Devlin to his Prestige Records label, making him the first major local signing for the label and providing Warren with his first (of very many) forays into the local recording market. Warren was born to the task of turning his young rocker signee into a bona-fidé New Zealand superstar. The first version of Devlin’s debut single ‘Lawdy Miss Clawdy’ was recorded in May 1958 at The Jive Centre and released the following month. The single was not initially a huge seller as radio refused to air the raw recording, but Warren persisted and sales grew slowly. Prestige released several more Devlin singles in 1958, plus EPs. There seemed to be a new Devlin record every couple of weeks (and sometimes there was). By the end of the year Devlin’s mesmerising live act, coupled with Warren and co-manager Graham Dent’s hype and astute management, had pushed Devlin’s fandom to frenzied levels never before seen in New Zealand. And then Warren re-recorded ‘Lawdy Miss Clawdy’ in February 1959 and the floodgates burst. Nobody knows exactly how many it sold, Warren admitting openly in later years that the touted figure of 100,000 was perhaps somewhat exaggerated. Warren famously presented Devlin with a very large royalty cheque in public, only to take it back and rip it up when the cameras went. Whatever the sales were, it was an extraordinary and unique phenomenon in New Zealand, encouraging Prestige to issue New Zealand’s first rock and roll album in 1959, simply called Johnny. Prestige, stimulated by Devlin, also released a handful of other rock and roll singles, the best probably being Vince Callaher, whose ‘Moo Cow Boogie Blues’ was a fine rocker. Prestige also released several records by Carole Davies, a well-regarded pop singer of the day, but nothing approached Devlin for impact or sales. In late 1959, after buying out Henderson, Phil Warren merged Prestige into the new Top Rank International set up in which he was a partner, (with cinema chain Kerridge Odeon and the UK Rank Organisation) although Prestige would remain a label in that group until 1961. 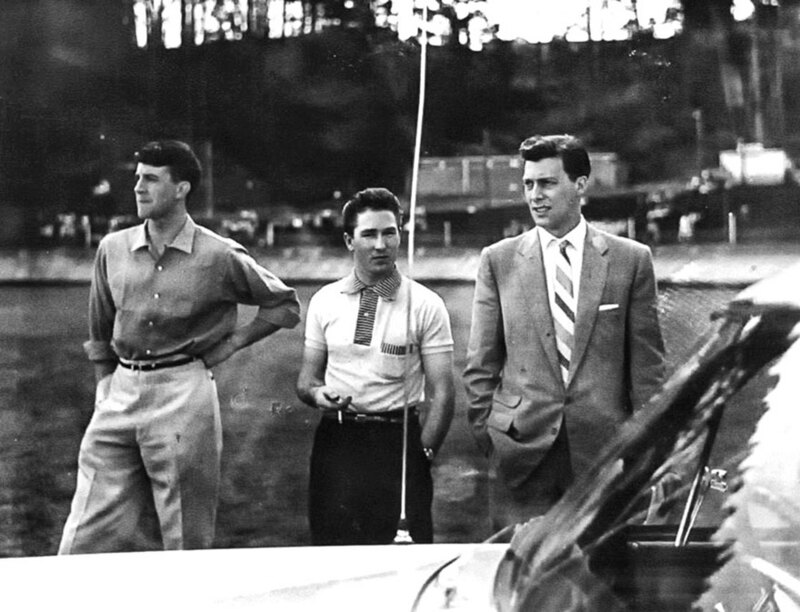 Top Rank was renamed as Allied International in 1961 when EMI in the UK purchased the Rank Organisation, the partnership was short-lived however and Warren and Kerridge sold the company, including Prestige and all its licences to the NZ Pye Group subsidiary G. A. Wooller & Co. Ltd. (headed by George Wooller). Phil Warren's Prestige Promotions Ltd. retained the rights to the Devlin catalogue. Prior to the split several Warren produced records would appear on Top Rank and Allied International including the hit 'Kiss Of Fire' by Kahu Pineaha in 1960. Warren would return to the recording business in 1966, with his new company James Productions (a partnership with Jimmie Sloggett) releasing via Festival Records and other labels, but the Prestige name would never again appear on new recordings.